Crafting your necklace display is an important part of selling your jewelry. The presentation of your jewelry is what will draw potential customers in for a closer look (and then they’ll fall in love with your necklaces!). There are a few things that you can do to display your necklaces in an optimal way. 1. Remember height levels. There should be a tall, taller, tallest element to your display so that your customers’ eyes are able to naturally “read” the display. Believe it or not, it’s harder for people to focus on products when they are in a straight line with no height differentiation. 2. Color scheme and props. Your display is the story of your jewelry. When you’re crafting this story, you don’t want to use elements that don’t fit the theme of this story. Use props and a color scheme that will compliment your jewelry and that will be coherent with your entire display. 3. Pick a display that is the best fit for your jewelry. We wrote a post about this last time, but to recap briefly, you want to choose the right display for your jewelry’s style. 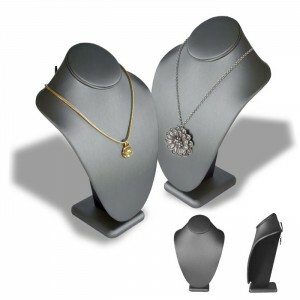 Necklace busts and necklace easels are both great options, as well as wire displays, but each type of display has pro and cons. Be sure to research which type will be best for your jewelry. Finally, just have fun! Creating a display shouldn’t be stressful or overwhelming. Relax, and enjoy the process. Necklace Displays: A bust or an easel? What’s the difference between a bust and an easel? Is one necklace display better than the other? Which one will work best for YOUR products? There are quite a few questions to ask when putting together a presentation for your necklaces! We think it’s time you had some answers–at least about the difference between these two great necklace display styles. Necklace busts work best for heavier jewelry or thicker necklaces or for displaying that isn’t going to be moved around a lot (such as a jewelry table in a store). Since the busts tend to weigh more than the easels, they’re often used for display tables in stores, or more elaborate and involved displays at art and craft shows (shows that last for several days). Unlike easels, busts are freestanding and do not pack flat. Although they are bulkier, they can hold heavier jewelry and have a very elegant, classic display look. Necklace easels are more lightweight, and work well for traveling to shows. They’re also a great way to display chains with pendants, but might not be the best option for heavy necklaces. Easels will also work on a display table, as they are easy to arrange and don’t really take up much room. 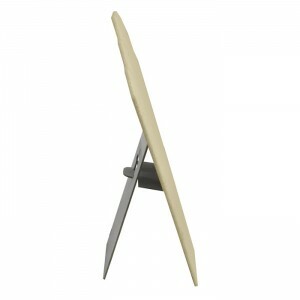 As the name implies, necklace easels have an easel back, which usually lies flat against the display when not standing up. The easel back is pulled away from the display and secured by another piece of the display that fits into the easel portion to keep the display upright. Side view of a necklace easel. So there you have it! Busts and easels are great ways to display necklaces, but the right one for you depends on your jewelry style, as well as where and how you’ll be displaying. With Valentine’s Day this week, we can’t stop dreaming in pink and red and purple–and we haven’t even shared our favorites with you yet! Although Valentine’s Day makes us think of pink, purple, and red jewelry packaging more than the rest of the year, we’re hardly limited to using these colors for just this month! We think these picks are perfect all year around. PINK PICK: This hot pink glossy tote bag won’t go wrong any time of the year! 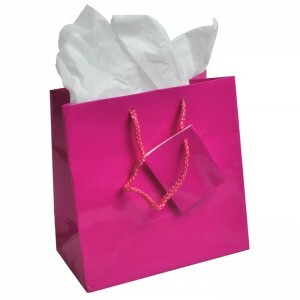 Pair with tissue paper for a packaging look that begs to be remembered. 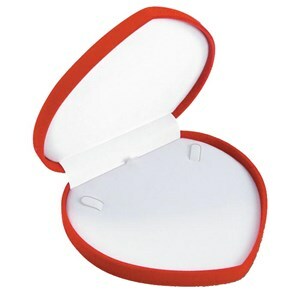 RED: This heart-shaped necklace box couldn’t be better for a romantic gift any time of the year! It’s perfect for that elegant pendant you’re displaying. Simply place the pendant in the center of the insert, secure the chain with the tabs, and place any excess chain in the bottom of the box. 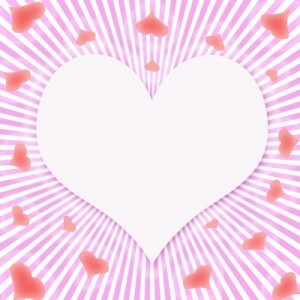 Nothing says “love” better than a heart-shaped box. PURPLE: It’s hard to pick our favorite purple product, but we’re going to have to go with our lavender flora satin ribbon. 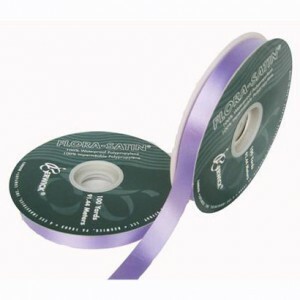 Tie a bow on top of any package with this help of this 5/8″ wide satin ribbon.